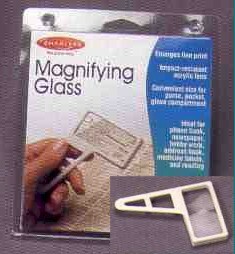 Magnifying Glass; Enablers, Elderly, Physically Impaired, Arthritis Sufferers. Enlarges fine print. Great for phone books, newspapers, address books, medicine labels and more. Impact resistant acrylic lens resists breakage and scratching. Convenient size fits in purse, pocket or glove compartment.